Art Uptown Gallery will present Rita Rust’s new watercolor paintings in a solo exhibit Drawn by the Water from February 23 through March 29. An artist’s reception will be held on First Friday, March 1, from 6 to 9 p.m. at the gallery, 1367 Main St., Sarasota. “Since time immemorial, humans have been captivated by water.” This Wallace J. Nichols quote sums up the essence of the exhibit. From creeks and rivers, oceans, lakes and harbors, to the Winslow Homer schooner print which has hung in her home (and now, her studio) since birth, Ms. Rust has always been drawn to the water. This collection of recent watercolors celebrates water in its endless manifestations as the unifying theme. 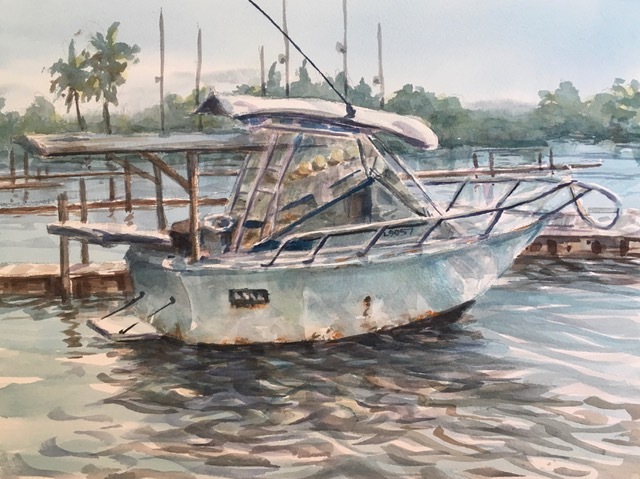 Ms. Rust’s exhibit includes a wide range of her painting styles, created plein air and in-studio and featuring water scenes found locally, in New England, and from a recent Hawaiian holiday. All celebrate the awe, beauty, peace and happiness which can be found in the presence of a body of water. In addition to the public reception on Friday, March 1 from 6-9 p.m., Art Uptown welcomes patrons and friends to share its thirty-ninth season in its Main Street location where the diverse works of 30 local artists are shown daily, Monday-Thursday, 11-5, Friday 11-9, Saturday 11-5, and Sunday 12-5. Telephone: 941-955-5409. www.artuptown.com.